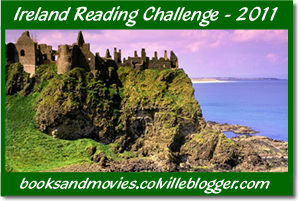 I don't think I can put off signing up for 2011 challenges any longer and the Ireland Reading Challenge is the perfect one to start with. Hosted by Carrie from Books and Movies, it's all about reading Irish authors or books set in Ireland with several levels - I'm going for the Luck o'the Irish level, which means 4 books. Sign-ups and all information is here. The challenge runs from January 1, 2011 to November 30, 2011. My list of possibilities is below. I really liked “Let the Great World Spin” by Colum McCann and I noticed you have it on your shelves – read or TBR? I've read Brooklyn, The Gathering, and the Secret Scripture and liked them all. Dorian Gray made me realize I like the person Oscar Wilde but not so much the writer. But it's short! Alex - That's true, Let the Great World Spin would also qualify, I'll add it. And I think I have an anthology of Irish chick lit stories, I'll add that too! raidergirl - I've heard such good things about pretty much all of these books, I'm excited to start reading them! Carrie - I'm looking forward to The Likeness, I loved In the Woods.